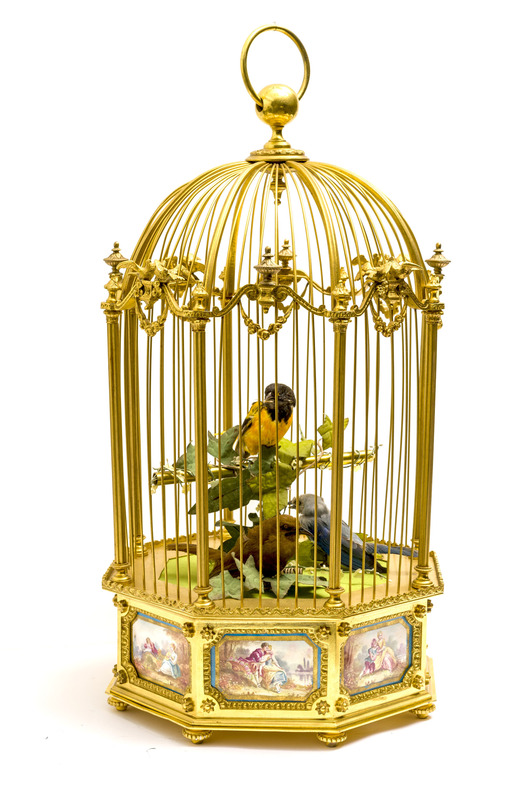 SINGING BIRD CAGE ATTRIBUTED TO BONTEMS Very fine and very rare, gilt bronze and painted on 8 panels enamel finely painted medallions with children, and pastoral scene, hanging bird cage with 3 automatons birds. Dimensions 55 x 31 cm. Bontems,the firm grew rapidly,taking part with great success in national and international exhibitions.in 1855,Bontems called himself ''inventor and maker of moving and singing bird clock,rope dancers and mechanical pieces'',and proudly stating that he was a ''supplier to her Royal Highness the Queen of England''.In 1860,it was noted that 90% of Bontems' annual production went for exportation. 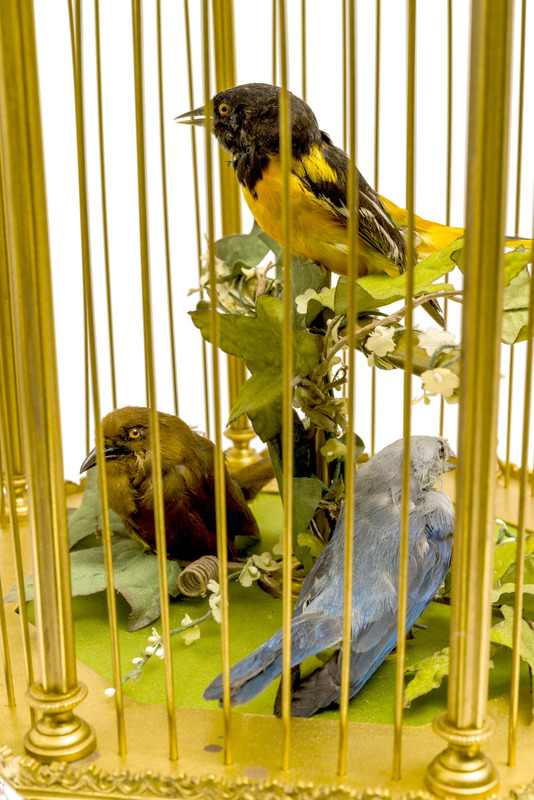 At the 1878 exhibition,Bontems requested a large stsand measuring 5 meters wide,3 meters high and 1 meter deep,in order to display his birds''on flower vases,in cage,aviaries clocks,and various other automatic subjects. ''The effect must have been striking. An observer at the 1878 exhibition recalled with statisfaction:''there is moo me visitor who doesn't stop to listen to the chrirping of Monsieur Bontems birds. Monsieur Bontems is a mechanical engineer as well as a naturalist. He has studied even the subtlest of birds' attitudes and the most capricious modulations of their song.He knows the manner in which they beat their wings,shake tails,the way in which they lift their clear,vibrant,joyful,or melancholy notes ring out.i do not believe anyone has imitated nature quite as successfully.